Jupiter is the king of all planets in the Solar System. It is the largest one, mostly composed of gas, and is thought to have formed earlier than most of the rocky planets – including Earth – in the history of the Solar System. It is of prime interest because it keeps a record of the elemental bricks of the Solar System’s early stages hidden in its deep interior, a record that NASA’s Juno mission is currently trying to reveal [Bolton et al., Science, 2017]. To most people, Jupiter is a bright wandering star, only outshined by the Sun, the Moon, and Venus at night. However, for amateur astronomers and scientists, it is known for its colorful-banded structure, its gigantic Great Red Spot, and its string of four major satellites discovered by Galileo in the early 17th century. Fig 1: New perspective on Jupiter, as seen by Juno. Besides the complex cloud structure seen on Jupiter’s outer atmospheric layers, little is known about its interior. 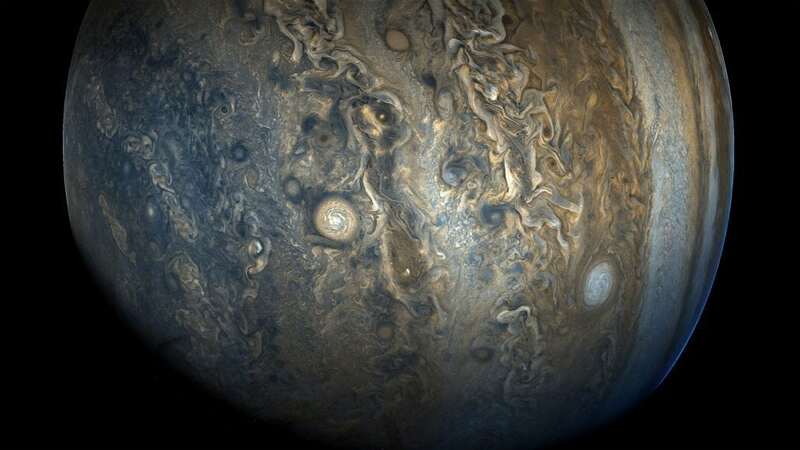 Scientists around the world have been extensively observing Jupiter for ages, but their instruments only probe the outermost 4,000 km of its atmosphere, a mere 3% of Jupiter’s total 70,000 km radius. Understanding Jupiter’s outer layers is the only way to apprehend the planet as a whole through its interaction with the deeper interior, the local interplanetary environment, and its satellites. Jupiter is mainly composed of hydrogen and helium, with a small amount of methane and other trace species. Methane plays a crucial role as it interacts with the ultraviolet light coming from the Sun. The methane at the top of Jupiter’s atmosphere gets broken into smaller pieces by the sunlight and then sinks towards Jupiter’s lower atmosphere while chemically reacting to form higher and higher hydrocarbon molecules. Some of the most abundant ones, ethane and acetylene, have been measured and tracked from Earth and space observatories for decades. These molecules are of particular interest because they can be used as tracers for Jupiter’s stratospheric circulation, where there are no observable clouds to indicate those circulation patterns. The distribution of the two molecules was theoretically expected to mimic each other, because they both arise from the same source: methane. However, one surprise revealed by Cassini was that they are in fact anti-correlated; the abundance of ethane was puzzlingly found to increase from the equator to the pole, while the acetylene showed the opposite trends, i.e. as scientists were both expecting them to do. 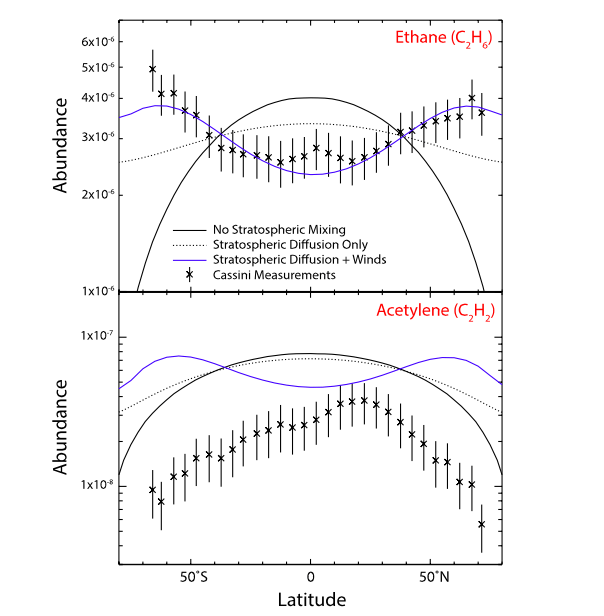 This discrepancy between the prediction and observations could be explained by various circulation mechanisms in Jupiter’s atmosphere that could transport ethane differently from acetylene, or by a different type of chemistry, which occurs in its Polar Regions. 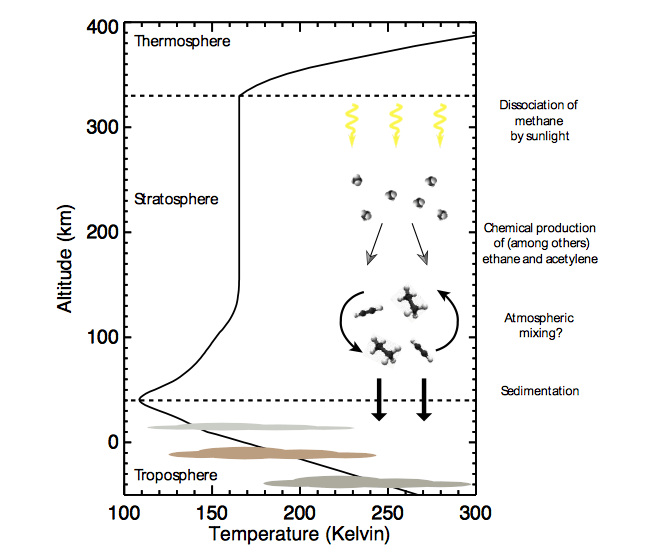 The authors developed a specific atmospheric model to simulate the distribution of these two molecules under various atmospheric motion patterns. The known motion mechanisms involve directional motion, for instance, winds, or diffusive motion, a similar process as letting your tea bag infused in hot water. 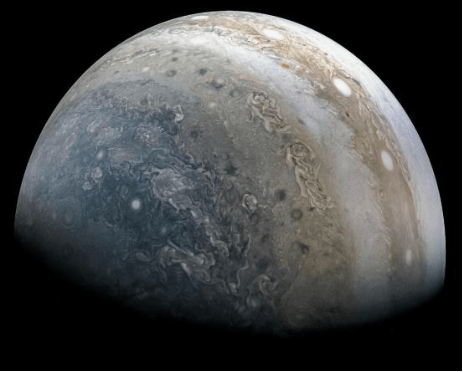 The atmospheric motion they used in their models comes from decades of observations that measured how the composition of the Jupiter’s atmosphere evolved over time. More specifically, a major cometary impact was observed on Jupiter in 1994, which brought numerous exogenous materials in several specific locations on Jupiter. Since then, Jupiter’s atmospheric motions has been traced by measuring how that material spread over the entire planet. One way to decouple ethane and acetylene is to invoke a different type of chemistry happening at the equator, or at higher latitudes. Jupiter’s poles are known for hosting the most powerful aurorae in the entire Solar System, triggered by Jupiter’s intense magnetic field, and which is another subject study of NASA’s Juno mission. These aurorae are a signature of the tremendous amount of energy being dumped in the form of energetic electrons in Jupiter Polar Regions. Chemical reactions involving neutral molecules and ions could theoretically be a way to decouple these two hydrocarbons and produce the observed chemical signature. In support of the Juno mission, recent ground-based observations from NASA’s Infrared Telescope Facility suggest that, indeed, the atmospheric region beneath Jupiter’s northern aurora experiences dramatically different conditions than the rest of the atmosphere [Sinclair et al., Icarus, 2018]. Not only the atmospheric temperature was locally enhanced by about 20˚K, but also the acetylene was locally enhanced in that same region, while ethane was enriched over the entire Polar Region. These results rule out Jupiter’s atmospheric circulation as the cause for the puzzling distribution in atmospheric composition revealed by Cassini. However, this opens up a new research direction where scientists will have to understand how the stratospheric chemistry is affected by Jupiter’s magnificent auroral lightshow. These findings are described in the article entitled Photochemistry, mixing and transport in Jupiter’s stratosphere constrained by Cassini, recently published in the journal Icarus. This work was conducted by V. Hue from the Southwest Research Institute, F. Hersant and M. Dobrijevic from the Univ. Bordeaux, T. Cavalié from the Observatoire de Paris, and J.A. Sinclair from the Jet Propulsion Laboratory/California Institute of Technology. I am part of the science team running the UV-spectrograph on NASA's Juno mission. My duties involve observation planning , calibration and monitoring the health of the instrument, data pipeline, science interpretation and exploitation. I am also involved in public outreach. Franck and Michel are research scientists at the University of Bordeaux. I am currently working as Research Scientist for the CNRS at the LAB institute (Laboratoire d’Astrophysique de Bordeaux) and I am also affiliated to the LESIA institute (Laboratoire d’Etudes Spatiales et d’Instrumentation en Astrophysique) of the Paris Observatory. I am working on the preparation of the European Space Agency JUICE mission (Jupiter Icy Moons Explorer) as “Jupiter” Working Group co-lead. I am also co-I of the Submillimetre Wave Instrument (SWI) of this mission. My research focuses on the study of planetary atmospheres, especially those of the Solar System giant planets, by means of (sub-)millimeter observations. I am analyzing Herschel and ALMA (Atacama Large Millimeter/submillimeter Array) data and I use thermochemical and photochemical models to interpret them. James is a research scientist at JPL. 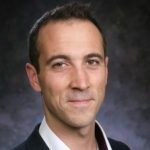 His research interests include the interaction between Jupiter’s stratosphere and its aurora and the structure, chemistry and seasonal evolution of the stratospheres of the outer planets. This work involves the measurement and analysis of several datasets including mid-infrared observations from the Cassini and Voyager missions as well as Earth-based observations measured on the VLT, NASA’s IRTF, Gemini-North and Subaru. He grew up in Aberdeen in the United Kingdom.